Well it was that time of year again as we made our annual trip to the last home game of the season and to what we all expected would be an end of season kick about. The powers that be at West Ham obviously felt that this game was akin to the Champions League final as they extorted £65 out of us for a ticket – that equates to €90 each!!! It should be noted that the Everton players subsidised the 3,000 travelling fans ticket costs – their tickets were priced at £55 for the game. 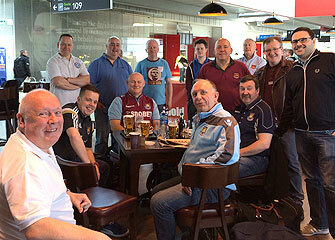 Anyway, we all met in the bar at the airport and new Dublin Hammers gear was dished out to those who had placed orders. 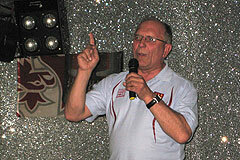 There was plenty of banter as tales of previous trips and legendary characters were recounted. The flight was uneventful – the President did get to sit near the front of the plane but wasn’t allowed into the cockpit – apparently the pilot had heard the “Paddy the Monkey” joke once too often. 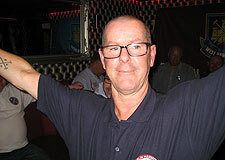 We land and head for the bus, but had to wait an age for young Daryl Cox to reappear from the Gents – rumours that he was practicing his dance moves in front of the full length mirror cannot be confirmed. The bus itself proved to be a luxury coach but without the microphone, so it was difficult to make out what “Tour Guide Liamo” was saying – it was something about don’t drink too much, remember your ticket, don’t talk to strangers etc. On to Romford and the hotel, we throw our bags in and meet the previous Travel Secretary and DH Artist in Residence (in Germany), Josh Holland. The bus dropped us off at the ground and we all headed different ways, some to the club shop, some to the bookies and me to Kens Café for a healthy breakfast. The meeting place before the game was M&Ms, which I am starting to warm to if only because the bar staff can serve people no matter how many are in the pub. Off to the ground and the seats were good in fairness – it’s a pity about the match. The first half was a complete non-event with both teams going through the motions. Half time arrived and I made the mistake of queuing up for a beer – it was unbelievable the incompetence of the staff behind the counter, you would think that someone would realise that come halftime there may be a lot of people looking for a drink – think again!! The second half finally came to life when Song and Downing put together the only piece of football that we played and Downing scored. Everton woke up! Osman equalised and as we all settled in to see a 1-1 draw play out, and then deep into injury time Lukaku scored the winner. 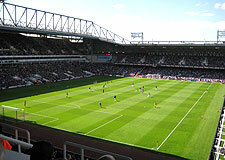 Cue a mass exodus of Upton Park, the final whistle blew but people were so busy leaving, no one really noticed. 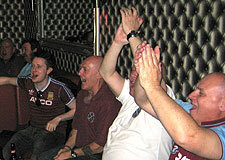 My own thought was that any team that relies on Carlton Cole to score goals for them is in trouble straight away. Only 2 members stayed and watched the team came out for a lap of honour, I believe the president pointed out to Sam that the stands were empty, and that the word “shambles” was used frequently! It was back to M&Ms and more pints. This is where it really started to be a weekend worth being on – the karaoke was great fun with all the usual gang singing their hearts out. In the background the tv screens showed Palace stuffing Liverpool in Steven Gerrards last game, much to the amusement of all in M&Ms, no love lost there! 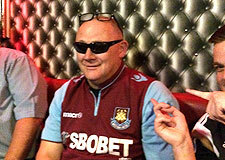 Afterwards Jimmy Conway and myself went for a drink in the Supporters Bar with Steve and Hayley. 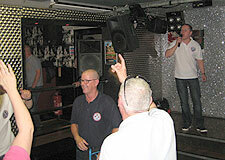 With everyone back at the hotel, Jimmy and I headed to another Shameless style pub in Ilford for a disco. 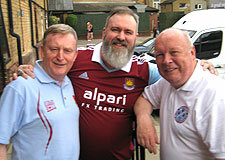 The rest of the lads congregated at the Golden Lion in Romford where against a background of 70s soul and reggae the Dublin Hammers Annual Dance Off was soon in full flow. After some slick (and not so slick) moves, the semi finals lined up with Liam vs Tommy and Bad News vs Josh. Tommy’s soul-spin eased him thru to the final, while Bad News performed a collection of flashy hip hop moves to shut out Josh. So to the final, which in all honesty was a disappointment after the excitement of the semis, Tommys relentless snake hips out scoring Bad News, who later on reflection, confessed to using all his moves in the semi-final. Congratulations go to Tommy Noctor! Then it was time for more dancing as we headed across the road to Yates’s Nightclub until the wee hours! In ones and twos members headed back to the hotel somewhat weary after being on the go for 22 hours! Sunday was another beautiful sunny day and saw most of us breakfast in Weatherspoons before having a look around the West Ham superstore. At one point, upon viewing the range of “mini player collectables’ one member asked if Andy Carroll came with his own medical team and an ambulance… this caused much laughter from everyone in the store! After checking out, we headed into central London, some went to view the Olympic Stadium at Stratford, soon to be our new home, while others opted for a tour of some of the markets and pubs of London. We all finally met up at Liverpool Street to get the bus back to the airport for the late flight home. 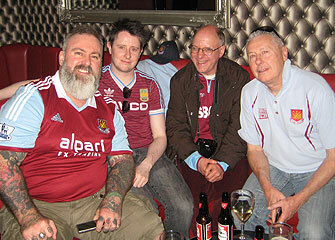 The banter on the bus was terrific and the beer and food was well received. Naturally enough we all went to the bar in the airport and slept on the flight back – my apologies to the poor young girl sitting beside me as nobody warned her about my snoring. Sometimes these trips are given a name, their were two doing the rounds for this one, the 'SSS trip' - Sam’s Swan Song (here's hoping) or the president came up with the “Run-a-Muck” trip, and did we? After taking 3 days to fully recover, I think we probably did! A big THANK YOU to Travel Sec. Tom and the Committee from all who travelled.